Carolingian, Louis the Pious. AD 814 to 840. Silver denier. Date : ca. AD 819. Size : 19.5 x 20.0 mm. Weight : 1.71 grams. Obverse : Small cross HLVDOVVICVS IMP around. Reverse : Small cross, with METALLVM around. 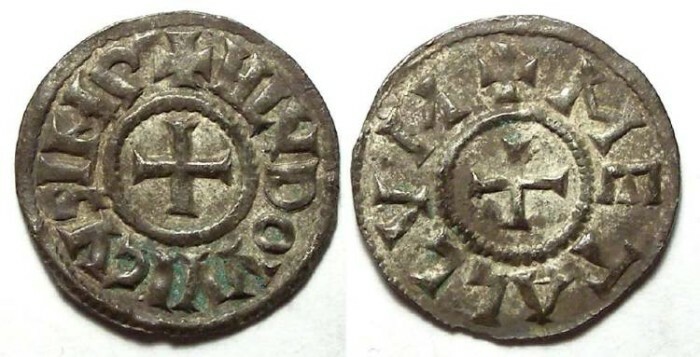 This particular coinage is discussed in MEC on page 215 where they mention that these coins with the mint name around the cross rather than across the field are fairly rare, and have to have been struck early in Louis reign.